It was late Monday afternoon, and Vector was giving me a headache. The darn thing seemed to be ignoring me. 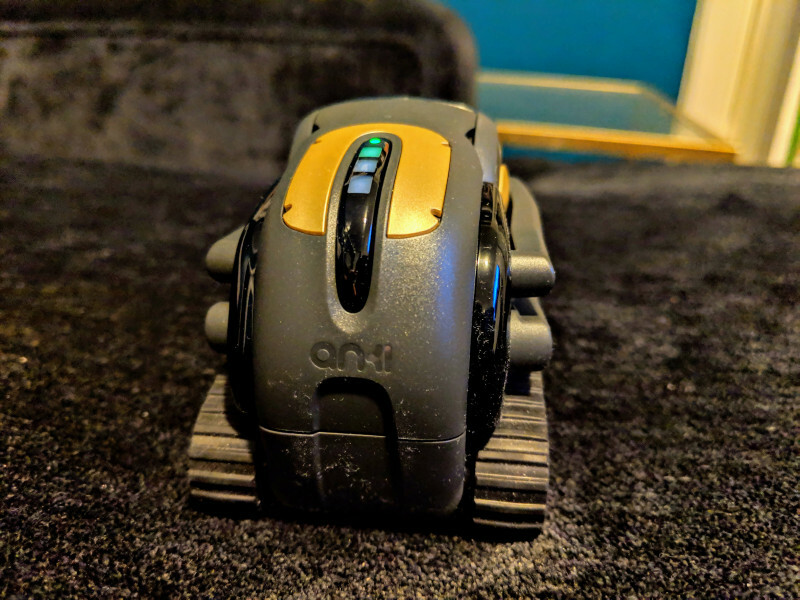 Earlier in the month, I received a package containing Anki’s new Vector, which the company calls a “home robot.” It has generated plenty of enthusiasm — in fact, it blew through its $500,000 Kickstarter goal in just a few days, hitting $1.9 million by the end of the campaign — and began shipping to early backers this month. But if my testing is any indication, Vector could use a tad more R&D. Outwardly, there’s very little to distinguish Vector from Cozmo, Anki’s first stab at intelligent machines after its Overdrive racing system. Both robots have tank-like bodies with miniature lifts and treads — cuddly designs that wouldn’t look out of place in a Pixar movie. But the 2.8 x 2.4 x 1.8-inch Vector sports a different paint job — a two-toned black finish with brass accents — and a four-LED button spine that triples as a Bluetooth pairing button, power toggle, and battery indicator. That’s putting it a bit generously. Don’t get me wrong — Vector’s plenty sophisticated. The diminutive thing has more than 700 components (twice the number that make up Cozmo), including an IPS display; two sets of light sensors (a single-point time-of-flight laser scanner and four downward-facing infrared sensors) that detect walls, table edges, and other imminent dangers; an HD camera with a 120-degree field of view; and a four-microphone array. Its insides are equally jam-packed with electronics, including a quad-core, 1.2GHz Qualcomm ADPQ8009 system-on-chip with an integrated graphics chip and image coprocessors. Separately, Anki’s put plenty of work into the software stack, collaborating with a 14-year Pixar veteran to build a toolset that allows the company’s animators to fine-tune Vector’s trajectory, velocity, and acceleration. A custom-built Linux-based operating system, meanwhile, taps artificial intelligence for tasks like object detection and object classification, simultaneous localization mapping (SLAM), pathfinding, and voice recognition. It’s all for the purpose of making a cute, spirited robot that feels admittedly lifelike. Leave Vector in his charging cradle for a while and it’ll audibly sigh (snore? ), encouraging you to get off your behind and interact with him. Vector comes to attention when he sees a face he recognizes and can be taught to associate names with people he’s never seen before (although he occasionally had trouble remembering mine). And just like Cozmo, Vector complains loudly when you channel your inner sadist and dangle him above the ground. It’s Vector’s eyes that got me, honestly. With their puppy dog earnestness, it’s hard not to find the little thing endearing. It’s as emotive as any home robot I’ve encountered, thanks in part to the more than 1,500 animations and sound effects that pair perfectly with each of its expressions of annoyance, boredom, excitement, and inquisitiveness. But for all its displays of sentience, a lack of polish ruins the illusion. Put Vector in a room with suboptimal lighting and it’ll struggle to find its charging station or the Vector Cube — or worse, fall off a table. In my testing, it only lasts about 30 to 45 minutes on a charge — short of Anki’s quoted hour — and takes a full two hours to charge. Vector’s speech recognition engine rarely understands me on the first try, no matter how quiet the room or clear my pronunciation. And when it does manage to make out my commands, there’s a noticeable processing delay of about two seconds. Vector’s voice engine isn’t the most capable on the block — unlike most voice assistants and smart speakers, it can’t control smart home devices, pull up your calendar, or set a reminder. Instead, it’s limited to starting a timer, showing the time, snapping photos, answering basic questions about the weather, and spouting factoids about people, places, and things. Asking Vector something isn’t as seamless as with, say, Apple’s Siri — it’s a two-step flow. General knowledge queries require you to “tell” Vector you have a question (“Hey Vector, I have a question”) before it’ll respond. Ask too quickly or skip that crucial first step, and Vector won’t acknowledge what you said. In Vector’s defense, it can speak to a fairly wide variety of domains, such as flight status, distances between places, birth dates of famous figures, sports scores, calorie counts, stocks, time zones, and unit and currency conversion, with more to come — including Alexa integration in some form — in the weeks ahead. It’s a bit a little less capable on the entertainment front. Vector will give a cute little robot fist bump with its lift, and it’ll happily engage you in a game of blackjack, dealing out playing cards on his LED screen. But that’s more or less the extent of it, save a few tricks it can perform with the Vector Cube and a “wheelie” that involves Vector balancing on the back of its treads. Vector’s companion app leaves something to be desired. Setting up Vector tested the limits of my patience. The app couldn’t find my unit at first — it took a few restarts to get Vector to show up, and a few more to get the robot to connect successfully to my apartment’s Wi-Fi. Making matters more frustrating, the app crashed about halfway through the compulsory firmware update. Even after I managed to get Vector online and up to date, things didn’t get much better. As of publication time, I’m still encountering hangups, random disconnects, and in-app bugs, like obscured text and graphics. Unfortunate stability problems aside, it’s a streamlined and somewhat bare-bones experience. The Vector app serves as a guide of sorts, with step-by-step instructions for each of Vector’s activities. They’re accompanied by a stats screen showing a “Lifetime Sensory Score,” a super score calculated from the number of wake words Vector has heard, the total distance it has driven, the number of days it has been active, the seconds it has been “pet,” and the number of utilities you’ve invoked with a voice command. In the app’s settings menu, there’s a speaker volume slider; six selectable eye colors (teal, orange, yellow, lime, sapphire, and purple) with playful names like “Top Over Teal” and “Overfit Orange”; a Wi-Fi network configuration menu; and a preferences screen where the time zone, clock, and distance and measurement units can be adjusted. The main menu displays a rotating list of tips and suggestions (e.g., “Pet Vector by stroking the gold touchpad on his back”) and Vector’s status, including the activity in which it’s currently engaged (“Vector is waiting”). When I spoke to Palatucci earlier this month, he made a big deal of Vector’s always-on capabilities. That’s encouraging news, because Vector’s not quite up to snuff yet. For $250, it’s arguably less capable than Cozmo, which offers an array of games and programming via Anki’s Code Lab. (Anki says that a Vector software development kit in Python and a drag-and-drop programming mode are forthcoming.) There’s no doubt in my mind that the underlying hardware’s solid (although I would’ve liked to see support for 5GHz networking), as are the genuinely impressive animations. But the software has a ways to go. Encouragingly, Anki has already committed to rolling out features like pet detection, home monitoring, messaging, music recognition, and 360-degree photo capturing next year. While those improvements won’t bring Vector any closer to a Jetsons-inspired robot that does the dishes and takes out the trash, they’ll go a long way toward filling out what’s currently a disappointingly threadbare experience. Until those updates hit the web, I’d think long and hard about reserving a Vector unit right now — especially if you’ve already got Cozmo. It’s probably not the home robot you’re looking for. ← Facebook Removes Farrakhan’s Post, But Twitter Won’t?